"You don’t take things for granted like you used to," Manchester Police Officer Ryan Hardy said. It was after 10 o’clock on a Monday night when we arrived at Hardy’s Manchester home. He was just getting ready for work. He had already given his two little boys a bath, tucked them in, and kissed his wife Amanda goodnight. "Everything has a little bit more meaning, especially when you know you’re leaving to go back into that environment of the unknown," He said. Hardy is the Manchester police officer you can hear on a chilling radio call from May 13, 2016. 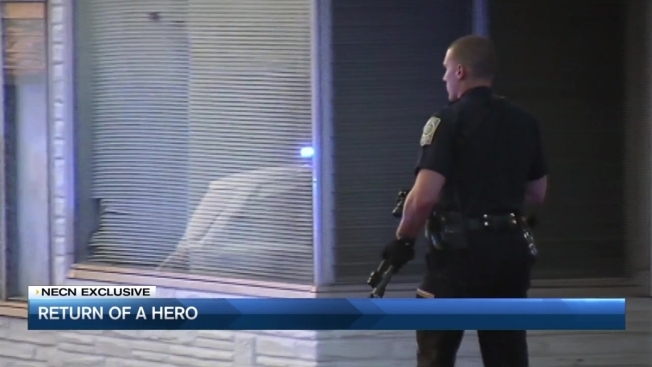 It's a story of courage and passion, of how a Manchester, New Hampshire, police officer shot in the line of duty made his way back to work. "Shots fired, shots fired, I’ve been hit," he yells. Over the radio, his fellow officers heard Hardy gasping for air and still describing the suspect who shot him in the face and in the back. "White male, long hair, trench coat," he said. For the first time since that day, Officer Hardy is telling necn what it’s like to be back on the streets and back to the job that almost took his life. Hardy says "there was never any doubt in my mind" about coming back. He says that that feeling was solidified just hours after the shooting. As Hardy was rushed to a Boston Hospital, he says the support along the way gave him strength. Local and State police officers stood at attention along his route while cruisers with blue lights flashing escorted the ambulance all the way to the hospital. "It’s a surreal feeling to go from a moment of hopelessness and despair to knowing that everyone is there for you and would do anything it takes to make sure you get back on your feet," Hardy said. Hardy spent three months recovering and then came back to work, of course, with Amanda’s blessing. "I love doing what I do and she didn’t at any point think I wasn’t going to return," Hardy said. He admits the first time out alone was tough. "Somethings make you more uneasy than others until you fully work through everything," Hardy said, but added that "Everything feels back to normal." What’s different is his perspective each time he gets out of his cruiser. "Making car stops, responding to alarms, different calls that we do every single night, and in an instant it changes," Hardy said. "That’s definitely the biggest thing that’s changed is thinking of how you’re going to handle the situation if it does turn into the worst day ever." And with every response, Hardy realizes "the worst" could happen again. Making the little things in life that much better. "You know, always just take a second and cherish what you have," Hardy said. 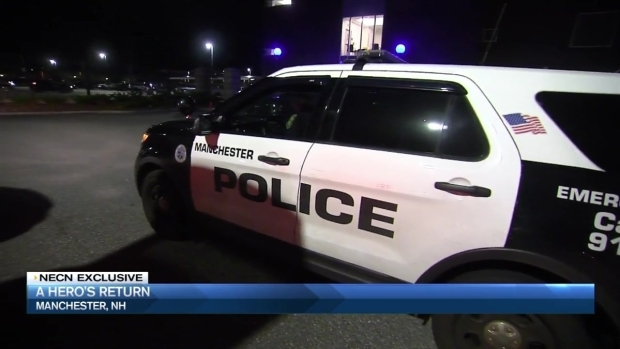 There was never any question for Officer Hardy that he would go back to patrolling the streets of Manchester, New Hampshire, after being shot. But the events of that violent early morning in May will always be with him. He took our crew back to Ferry Street on Manchester’s West Side to the spot where he was shot. "He was walking north towards us," Hardy said as he recalls the moment that he saw a man matching the description of a bank robbery suspect from the night before. "I decided to pull onto Ferry Street here," Hardy said. What came next was previously unimaginable. He got out of his cruiser to question the man and within seconds – "The hairs on your neck stand up and I knew something bad was about to happen," Hardy explained. "It was like being stuck in cement you just can’t move fast enough to get out of the way" - the man pulled gun and opened fire. It was an instant that would change Hardy’s life forever, and the breathless moments after were all captured on his radio. "As soon as the gun goes bang everything sped up and it was training, auto pilot, whatever you want to call it," Hardy said. "It was really just survival mode at that point, just getting away from the threat that was trying to take my life." While he tells his story, his physical scars are visible. "The first one was in the cheek here and ultimately it came out the back of my neck," Officer Hardy said as he pointed to a scar on his right cheek. The second bullet hit him in the back as he ran for his life. With four wounds from two bullets, Hardy managed to call for backup and warn his fellow officers. "White male, long hair, trench coat," he called over his radio. "I wanted to make sure that everyone know exactly what to look for so they could stay safe," Hardy said during our interview. After the radio call, he finally found his way to the front end of his cruiser and ducked for cover, counting the seconds until help arrived. "It was only 30 seconds or a minute, but seems like forever when you’re out there," Hardy recalled. The suspect, Ian MacPherson, shot another officer before being captured. In a press conference at the station on the night of the shooting, Manchester Police Chief Nick Willard called it one of the darkest days in the history of his department. "I believe there was grace shining down on Officer Hardy – but you can’t discount his warrior spirit and his will to survive," Willard said. "When we sign up for this we know of the dangers that are out there, but we all do it for a reason," Hardy said. A reason strong enough to bring Hardy back to work within three months, not because it’s his job, but because to serve and protect is his life’s mission. "I believe in what we do and making our community better and that’s why I do it," Hardy said. Both Hardy and the other officer who was shot that morning received awards for their bravery. MacPherson is charged with attempted murder. His case is still pending.